The William Randolph Hearst Greek Theatre, known locally as simply the Greek Theatre is a beautiful and ancient Greek Amphitheater located in Berkeley California. The venue is maintained by the University of California. 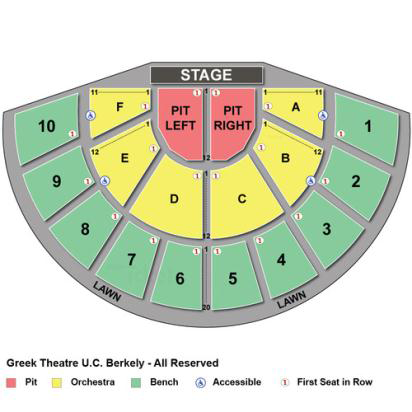 The image below shows the Greek Theater Berkeley seating chart. As you can see the configuration is that of an ancient amphitheater with a rounded seating plan. Seating tickets are sold on first come first basis. The fixed seats provide a great view of the stage and get you right up close to the performers, where as the lawn area gives a much greater social side to the event. The lawn area is raised high above the seating for fantastic views. Wherever you decide to go, you’ll be sure to enjoy the events, depending on your seating preference. Please beware that ticket prices will vary per seating area. For a full list of events, please see the Greek Theater Berkeley schedule.